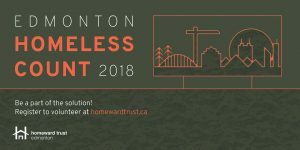 Homeward Trust along with volunteers and community partners will be conducting a count of people experiencing homelessness in Edmonton. The Homeless Count have been conducted in Edmonton since 1999, providing a snapshot of homelessness in our community, while monitoring changes and trends in the homeless population over time. The results of these counts are used by community agencies, researchers and government to inform ongoing efforts to prevent and end homelessness. Please contact Janine – jtremblay@homewardtrust.ca if you have questions about volunteering.